Cannon County's Taylor King, right, puts up the shot that gave the Lionettes a 42-40 lead with 2:01 remaining. They went to beat Upperman 47-42 in the District 8-AA semifinals. SPARTA - Players could learn a great lesson from Cannon County junior JoAnna Young about the value of being part of a team. Young is one of those throwback players who seems to understand that no player ever is bigger than a team and she is proof that fulfilling your role can lead to great accomplishments. The high-energy Young also demonstrated it is not the quantity of minutes you play, but the quality of those minutes that matter during No. 8 Cannon County's 47-42 upset of No. 5 Upperman in the District 8-AA Tournament semifinals at White County High School Saturday. Young played the fewest minutes of Cannon County's players, coming off the bench as the second reserve in the second and fourth quarters. Young's harassing defense during the two four-minute segments she played was as pivotal to the team's success as any singular aspect. "I just go out there and work hard," Young said. "I try to play the best defense I can and play as hard as I can when I get out there. It's great just to be a part of this team and our accomplishments." Cannon County has a chance to win its first District 8-AA Tournament championship since 1992 when it faces No. 4 Livingston at White County High School Monday at 7:30 p.m. Young's stifling defense on 8-AA Co-Player of the Year Kayla Biles in the semis is one of many reasons. Biles, who finished with 21 points, did not score a field goal during the time she was guarded by Young. In fact, it was even difficult for her to get the basketball given the manner in which Young was denying her and getting into passing lanes. "JoAnna is an awesome defender," senior teammate Emily Sissom said. "We knew if we put her on Kayla Biles she was going to get in her head. She did exactly what she was supposed to do and even hit a critical shot during our run. JoAnna was awesome (Saturday)." So why not play Young more and for longer periods? Look at what she did and how effective the team was with her on the court. Perhaps there are reasons why coaches coach and likely know their team better than anyone. Lionettes Head Coach Michael Dodgen had a plan in which Young would be instrumental if it worked. "Using JoAnna the way we did in this game she always had fresh legs and we could leave her longer when we brought her into the game," Dodgen said. "She went in and guarded Biles with fresh legs and clearly was the difference. She was fresh, she was active and she was a difference maker for this team. JoAnna understands her role and she does it well. There's probably a lot of people in the crowd wondering why she doesn't play more but there's kids around her that do a good job, too." Young's final stint was the best. 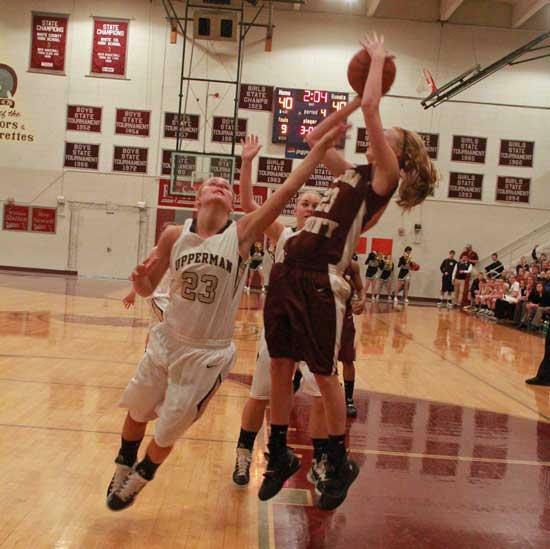 Upperman had overcome a 10-point deficit and gained a 40-36 lead with 4:27 remaining. Biles was the reason. She got going in the second half and scored 11 of her 21 during an eight-minute stretch. Biles turned the ball over twice and didn't get off a shot in the final four minutes as Cannon County rallied to win. "I was just trying to stay on (Biles), make sure she didn't get the ball and make sure she didn't get a shot," Young said. "That's all I was trying to do." GETTING TECHNICAL: One of the more astonishing postseason calls you will see was made midway through the fourth quarter of Cannon County's semifinal game against Upperman. Trailing 38-36 Cannon County's Lindsey Reed was advancing the ball toward midcourt when Biles went for the steal and was called for a block - her third personal foul - with 4:27 remaining. With Biles laying on the court, Reed and teammate Taylor King attempted to celebrate the key play that would put the Lionettes at the line with a chance to tie the game. Instead, King was slapped with a technical, Biles hit two free throws, Cannon County lost possession and trailed 40-36. "Lindsey had controlled the ball and she did a great job so I was actually going to high-five her for not turning it over and we missed high-fives," King explained. "We tried again and missed so it was kind of like a silly thing going on and then we just kind of jumbled up and he called me for a technical." The official explained that King given a technical for excessive celebration. Excuse her for getting a little excited in a Top 10 showdown against a league rival in a one-possession game and a spot in the District 8-AA Championship and a home region game at stake. Dodgen was livid on the sideline and emphatically voiced his opinion to all three refs at different times. He take on the call was politically correct in the postgame media center. "The rule says you can't celebrate and you can't taunt, so be it," Dodgen said. "It's a rule so I'm OK they called it, but I didn't like it. Officials are here to enforce the rules and they do it the best they can. The bottom line is an experienced team didn't fold." It was actually just the opposite. If anything, the technical seemed to ignite an even greater spark under the Lionettes - and King. The determined senior was sound throughout, leading the Lionettes with 16 points and 11 rebounds, but she was dominant with the game on the line. Following the technical, King scored two points, pulled three rebounds, forced a turnover and collected a steal. "In games like these, in the postseason, you have to win no matter what so I can't let a silly technical get me down because that would be letting the ref control my game," King said. "I just figured I had to let it go. That was not going to phase me." STATE OR DISTRICT? : When half the remaining field is ranked among the state's Top 10 you would think conversation would be about the state tournament, not district. That is not the case in the always-tough District 8-AA Tournament. Three of the AP Class AA Top 10 teams at the end of the regular season are among the four teams still playing in the District 8-AA Girls Tournament - No. 4 Livingston Academy (26-4), No. 5 Upperman (21-5) and No. 8 Cannon County (25-6). The Lionettes will have to go through two of those teams to win their first District 8-AA Tournament Championship since 1992. They beat Upperman 47-42 in the semifinals and will face another Top 5 foe in Livingston Academy for the title. Cannon County has wins over two Top 10 teams this season - No. 1 McMinn Central and No. 5 Upperman. "Most times in district play you get a big win and you move on and it's not as tough of an opponent, but not in this district," Dodgen said. "This is the best district and region in the state, bar none. Every night is a challenge. You have to be ready to play every night." HARD TO BEAT A TEAM 3 TIMES? : The saying it's had to beat a team three times held true in disappointing fashion for Cannon County's teams in the semifinals of the District 8-AA Tournament. The Lionettes, after losing to Upperman twice by 12 points in the regular season, beat them in the semis. The Lions had defeated Upperman twice in the regular season before falling to the Bees in the semis. Both Cannon County teams face Livingston Academy teams that swept them during the regular season so perhaps the adage will hold true once again. WELL REPRESENTED: Hundreds of Cannon County fans packed one side of the Sewell Gymnasium at White County High School for Saturday's semifinals. Cannon County's contingent was easily the largest of the participating teams. The fans were a definite sixth man for the Lionettes in their upset win. "Our crowd was awesome," Sissom said. "When Upperman made a run our crowd was right there and encouraging us to stay up. They got on their feet and was really big for our defense. It really helps when you have that type of support. We have the best fans in the state." LOOKING AHEAD: The Lionettes will face Livingston Academy for the District 8-AA Championship at White County High School Monday at 7:30 p.m. The Lions will face Livingston Academy in the 8-AA consolation game Tuesday at 6 p.m. The Lionettes have already earned a first-round home game in the Region 4-AA Tournament. They will face either Sequatchie County or Bledsoe County at Robert A. Harris Gymnasium Friday at 7 p.m. The Lions also have clinched a Region 4-AA berth and will travel to either Chattanooga Notre Dame or Sequatchie County Saturday at 7 p.m. If the Lions play Notre Dame that tipoff would be set for 6 p.m., Central. The semifinals and finals of the Region 4-AA Tournament will be held at White County High School in Sparta, Feb. 28-March 3. CANNON BLASTS: Freshman of the Year Abbey Sissom does not shoot much but when she does she has one of the highest field goal percentages on the team. Sissom was 3-for-3 in the Lionettes' win over Upperman, including a driving layup to give the team a 46-42 lead with 48 seconds remaining ... Justin Davenport scored 16 points in the Lions' loss to Upperman. Davenport has scored double figures in all 31 games this season ... The Lionettes have won five straight and seven of eight.